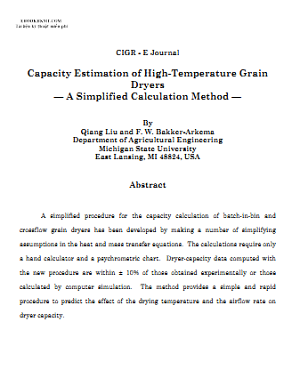 A simplified procedure for the capacity calculation of batch-in-bin and crossflow grain dryers has been developed by making a number of simplifying assumptions in the heat and mass transfer equations. The calculations require only a hand calculator and a psychrometric chart. Dryer-capacity data computed with the new procedure are within ± 10% of those obtained experimentally or those calculated by computer simulation. The method provides a simple and rapid procedure to predict the effect of the drying temperature and the airflow rate on dryer capacity.